Jenna wakes up from a coma and remembers nothing. She can't remember her past, nor can she remember the accident that put her in the coma. As she gathers strength, she starts to notice the whispers and the odd looks. She knows that things are not as they seem. But as she struggles to learn the truth, she realizes no one trusts her with her own truth. The answers are quite unbelievable but she'll have to live with them all the same. I loved the premise of this one once I understood it. It's more sci-fi and has less of a dystopian feel to it. It takes place in the future when medical advances are outstanding. Laws are created to achieve ethical boundaries but many questions are presented that truly made me think. I don't know that this one is about the characters so much as the ethical quandary. That being said I enjoyed Jenna's grandmother the most. I also thought Jenna's character was well constructed. Everything was unveiled at the perfect pace. Ms. Lamia didn't stand out in anyway but I enjoyed the audio very much. Her voices allowed the listener to distinguish between the characters but wasn't enough to really draw the reader in. It worked for me. Overall, it felt like a unique, interesting, and complete read that left me thinking. I remember when I listened to this one. 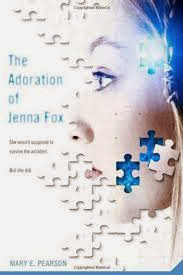 I really liked the narration and how it feel the style of the book - how Jenna's voice is very choppy when she first wakes up, but gains fluidity as Jena's thoughts do too - I thought it was a great premise too, though I didn't care for the sequel.